On my trip to the US in early December, my friend Mabel gave me a gift she had been holding for some time: a pair of banneton. These wicker baskets are used by the French when proofing bread dough – after it is shaped and is undergoing its final rise before baking. At some point in the past I had mentioned that I’d like to find some banneton and when she saw them, she purchased them for me. Since December I’ve had the opportunity to use them a few time and thought I’d share the results. The video is here, a nice, succinct two-and-a-half minute piece. If you cannot view, pictures are below. Link to the video is here. The banneton is traditionally made of wicker, although some modern ones are made of plastic. The purpose of the wicker, though, is that it wicks moisture away from the surface of the dough, making for a better crust. Proper flouring is essential, otherwise the dough may not want to leave the cozy nest of the banneton once it is finished proofing. After reading a few online baking sites, I decided to go with the suggested mix of all-purpose wheat flour and rice flour. This worked very nicely and I’ve had minimal troubles with sticking. It was also a neat way to use up some leftover rice flour. 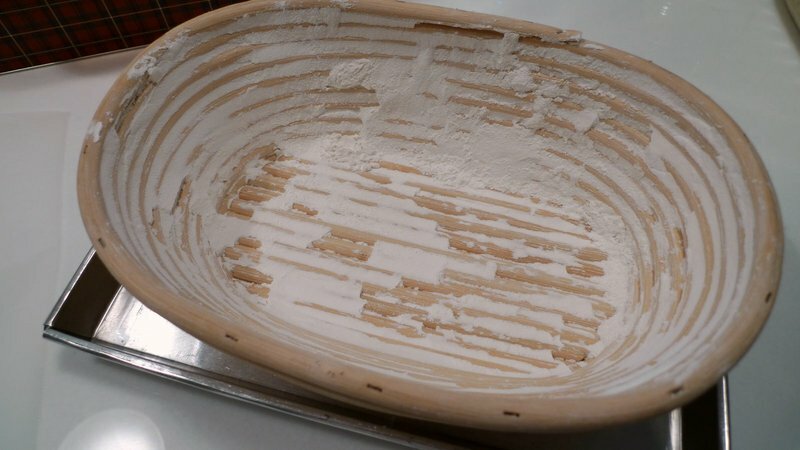 After removing the dough from the banneton, you can see the lines left by the wicker. A few slashes to help the loaf expand and then slide it into the hot oven and onto a baking stone. The end result is very beautiful and, I must say, rustic-looking. Not sure to what extent I can tell if the crust is really any better. I create a steam bath in the oven with a small tray of boiling water, so the environment is going to be about as conducive to a good crust as this home-use oven will allow. Nonetheless, Tawn and I have been enjoying the results, especially when it is time for panini! Thanks for the thoughtful gift, Mabel! This entry was posted in Uncategorized and tagged baking, Banneton, Bread, cooking, food, Mabel by christao408. Bookmark the permalink. I can imagine the nice aroma in your kitchen while the bread was ready! BTW, brother E made a banana bread last weekend, it was quite good too! I like the way he added in some walnuts. more bread! i am still waiting for the temperatures to warm up so i can actually get bread to rise in my kitchen. i might give in and just get myself a breadmaker though… i love freshly baked bread! Aren’t loafs usually misshapen? Haha, looks good! I love fresh baked bread and fortunately there is a new “Bread Shoppe” as they call themselves opening within walking distance from my home. Yummy!!! homemade bread is awesome! good stuff! DILICIOUS – I WANNA SMELL THAT FRESH LOAF!! Beautiful…and tasty, I’m sure. Lots of butter and some jam, preferrably homemade, should result in an unforgettable experience. Wow, the bread looks sooo perfect!!! I read this at work and it was making me so hungry! You make the best bread. I made a quick bread tonight and burnt it. So we cut off the outside and ate the inside! It was still good… I keep forgetting that the left side of the oven is evil. Looks really good. 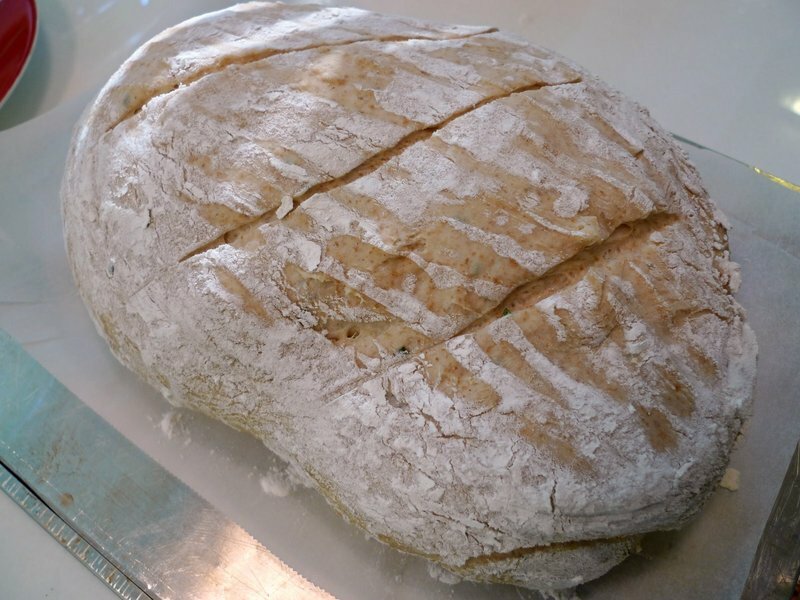 I have tried baking bread many years ago but I took the easy way out; I used a breadmaker. Now it is a white elephant. I think that I want some of those. Your loaves look beautiful. Ok – two straight entries of food…. I’m very hungry now!I think I remember seeing these things in some documentary before. So that’s what they are for. 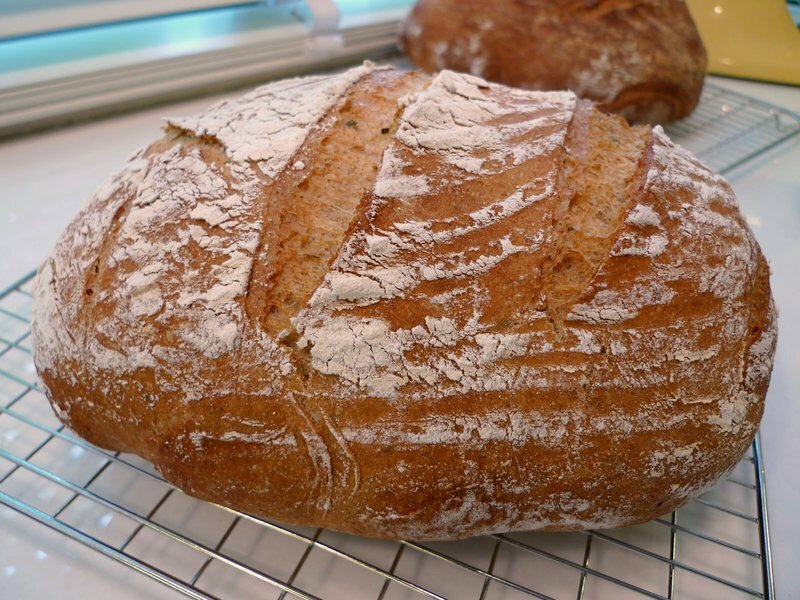 The bread looks absolutely wonderful and it has that wonderful rustic, artisan look to it. Btw – there’s a voice at 1:21 in the video. I can’t really catch it well enough. Just wondering what was said…As always, your videos are very slick. @ElusiveWords – Not sure what that voice is. Tawn was shooting and I don’t think we had anyone else there. Oh, actually, it may have been my maid now that I think about it. Very nice artisan bread! mmmmm! @Passionflwr86 – @yang1815 – @christine24666 – @perelandra30 – @icapillas – @ThePrince – @alwateen – Thanks for your comments. I have to say that I’m pretty happy with my bread. 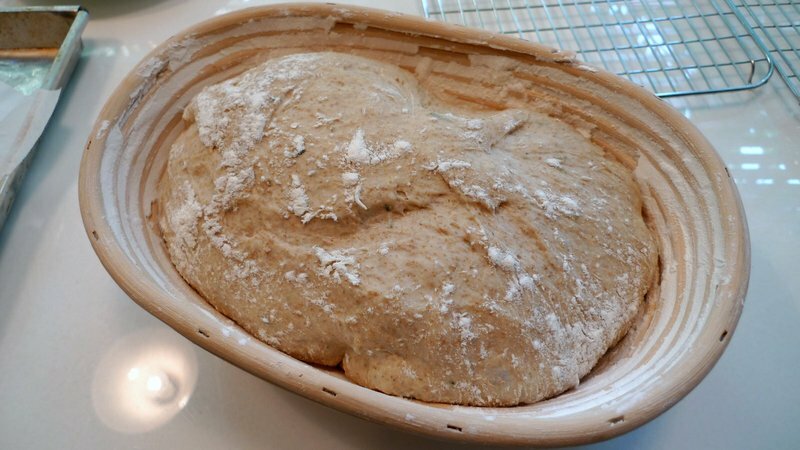 I’ve tweaked the recipe such that I get relatively predictable and consistent results and the joy of having the house filled with the smell of a fresh loaf in the oven? Well, that’s priceless! @seedsower – Yes, my trusty Kitchen Aid. Same color as the one in my mother’s kitchen, actually. I had to bring it with me to Thailand because it is just so handy. Of course, some days I’d like to have a slightly larger and more powerful model as this one can sometimes struggle to knead a large loaf’s worth of dough. @icepearlz – When I lived in San Francisco, I had a bread machine. What I didn’t like about it was that you had a relatively small loaf that had this tear in the bottom where the paddle had been. If anything, I could see using the machine to knead and proof the bread, but then bake it myself in the oven. 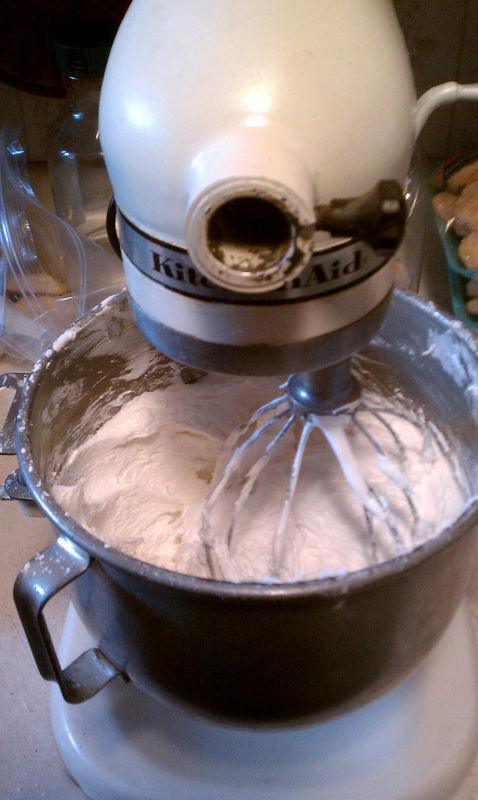 With the (virtually) no-knead method, though, it really is as easy as having the machine do it. @murisopsis – Odd… the right side of my oven has the over-heating problem. I need to have the technicians come out and look at it. The whole point of having bought a convection oven was for its even heating. Clearly, that isn’t the case with mine! @jandsschultz – Wish I could do some homemade jam-making. Since the fruits we get here are largely available year-round, the impetus to can or preserve is pretty low. @Fatcat723 – Looks like you’re going to have to do some bread “shoppe-ing” soon! Ha ha…@Roadlesstaken – If there is one thing I’d like to learn about bread baking, it is how to get a consistently-shaped loaf. Maybe a few weeks apprenticing at Amy’s Bread in NYC? @CurryPuffy – Seems like walnuts are a must for banana bread, if you ask me. Perfect combination of flavor and texture. Tell E I said hi.